Breakfast tends to get boring very quickly. 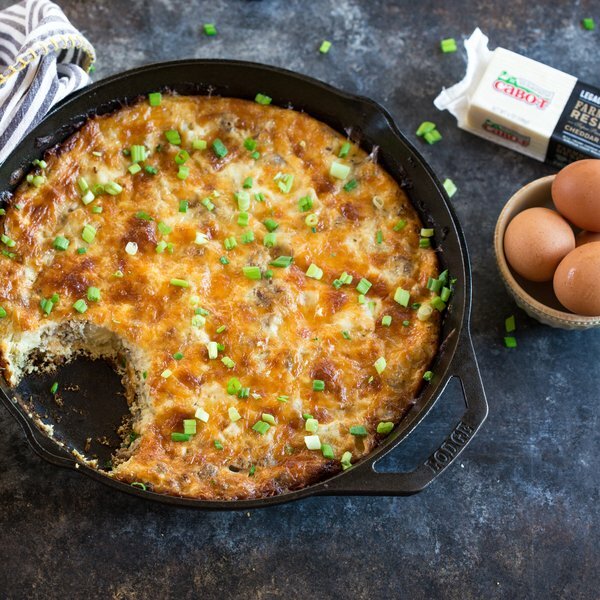 This Cauliflower Breakfast Skillet Casserole is sure to change up your standard breakfast fare! Perfect for a regular weekend breakfast or special occasion brunch, we think you’ll find this recipe is a definite keeper. You’ll want to share it with family and friends on Facebook, Pinterest, Instagram, and Twitter. For a 6 to 8 serving cauliflower casserole, gather the ingredients listed below and preheat your oven to 350°F. Brown the chicken sausage in a large skillet over medium high heat. Add the onions and cauliflower to sauté and caramelize, then remove from heat and scrape bits from bottom of the pan to incorporate. Season with Italian seasoning, salt, and pepper, to taste. Sprinkle shredded Cabot Farmhouse Reserve Cheddar (reserving 1 cup) and Cabot Shredded Mozzarella Whole Milk over cauliflower skillet mixture. Whisk together the eggs and milk in a large bowl and then pour into skillet. Give mixture a gentle stir and top with remaining cheddar cheese. Bake for 40-50 minutes, until eggs are set. Garnish with green onions and serve warm. For another hearty and delicious recipe, try this Loaded Baked Potato Quiche. Cabot is a co-operative of over 800 farm families who all work diligently to produce only the highest quality products. We’d love for you to share your thoughts about this cauliflower skillet casserole so, if you could rate and review it once you’ve tried it, we’d really appreciate it! BROWN chicken sausage in a large skillet, over medium high heat. Add onion and cauliflower to skillet to sauté and caramelize; remove from heat and scrape bits from bottom of pan to incorporate. Season with Italian seasoning, salt and pepper to taste. SPRINKLE cheddar (reserving 1 cup) and mozzarella over cauliflower skillet mixture. WHISK together eggs and milk in a large bowl; pour into skillet. Give mixture a gentle stir. TOP skillet with remaining cheese. BAKE for 40-50 minutes until eggs are set. Garnish with green onions. Serve warm. Recipe and photo courtesy of Kristina LaRue.